It’s been over a month now but, I’m still lingering in the memory of my road trip with Tom as we traveled down the Gulf coast from Houston all the way to Panama City Beach, Florida. Tom went for business. I went for refreshment and renewal. And to spend time with my hard working, often traveling husband! While he worked hard at the local branch of the company for which he works, I leisurely strolled down the beach and marveled that the white sands (which actually did glisten a bit) and turquoise water (clear as glass) could actually be the same Gulf of Mexico that washes ashore in Galveston where the water is murky and the sand has a sludge like quality to it. Now don’t get me wrong. I love Galveston! I have loved that place since I was a ten year old transplant from West Texas. Water is water and sand is sand when you are from the plains! Ah! But the waters off the west coast of Florida truly do rival the Caribbean islands (in my humble opinion)! I walked along the beach alone and because I wasn’t distracted by presence and conversation (notice how I put a positive spin to being “alone” on the beach!) I was an open eyed observer. And, as it turns out, my heart was somewhat opened to others around me as well. I came upon several clusters of folks enjoying the sand, the water, the view, each other. They seemed to be enjoying the moment and this space as much as I was. The difference was they were doing it in community, close community. It was obvious that this little moment in time held an eternity of meaning to these relationship clusters and there was a tangible awareness that memories were being made. I know this because, cluster after cluster, cell phones were out and pictures were being taken. Again, because I was alone and not interested in documenting anything with a selfie – a selfie would have simply brought about self-criticism and then the whole blood pressure lowering joy would have been shot – I awoke to the idea of a small calling. I could help others in making their moment together…complete. As I made my way down the beach I offered to take “the” picture so that no one would be left out. It was fun to see the delight and smiles on their faces, even as they hoped and speculated whether or not I could get the shot. I took my mission seriously. After all, this might turn out to be their Christmas card picture! I was a little sad when I came upon a grandmother – someone around my age, maybe a little older (hopefully!) – who was trying to get a picture of her two grandsons as their mom, her daughter, looked on nearby. I offered to take a picture of all of them as I had others. The grandmother and mother looked at me with such suspicion I almost felt the need to apologize. The grandmother mumbled no thanks and then reluctantly something about how she guessed I could take a picture of the boys if I wanted. She shifted around nervously. I clearly had broken their moment. I smiled and kept walking. I think maybe she didn’t understand that I was offering to take a picture with her camera. I honestly think she thought I was up to some kind of hustle! When I think of it now I see a similarity between this experience and the call to bear the invitation of Christ’s love in the world. We’re called to leave our own agendas behind. We’re called to meet people where they are in the midst of “their” moment and to lift up the lens of affirmation, which is the love of God saying, “You matter, this matters.” We’re called to reflect to them the beauty of their lives and their relationships, affirming it is all a gift we’ve been given that connects the moments of our lives with eternity. We’re called to be with people in the moment in such a way that helps them see that there is something greater, more significant going on in the moment than maybe they realize. We are called to embody the acknowledgement that they are seen and recognized as having meaning and significance to God. We’re called to be embody grace in such a way that they can take it with them into their own journeys, a hope to hold on to. Some will respond with delight, maybe even gratitude. Some will respond with suspicion, maybe even resistance or anger. But our call is to invite in love and peace, without judgement, and to leave the outcome to God. I hope. I hope that at least one picture I took that day ends up on a Christmas card this year. That would be cool. You never know. This entry was posted in connection, Faith, Lessons Learned, life purpose, nonfiction, Relationships, Spirituality, unconditional love, witness and tagged beach, Christ, connectedness, faith, God's love, grace, Jesus, lessonslearned, love, uncertainty, vulnerability. Bookmark the permalink. You have a way with words, I felt like I was on the beach too (if only). Thanks for the great read! 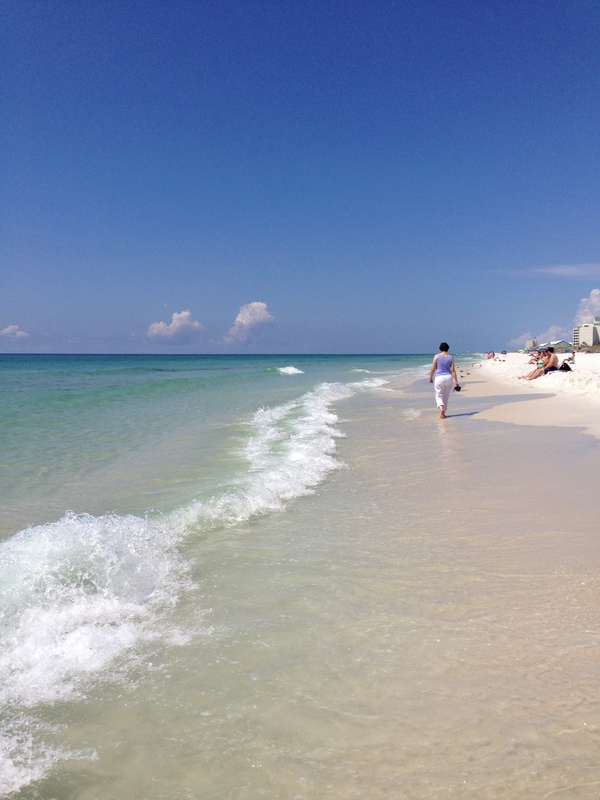 This beach does rival the shorelines of Turks and Caicos. Beautiful.